This elegant burgundy & gold gift box is foil-stamped with your logo on the cover. 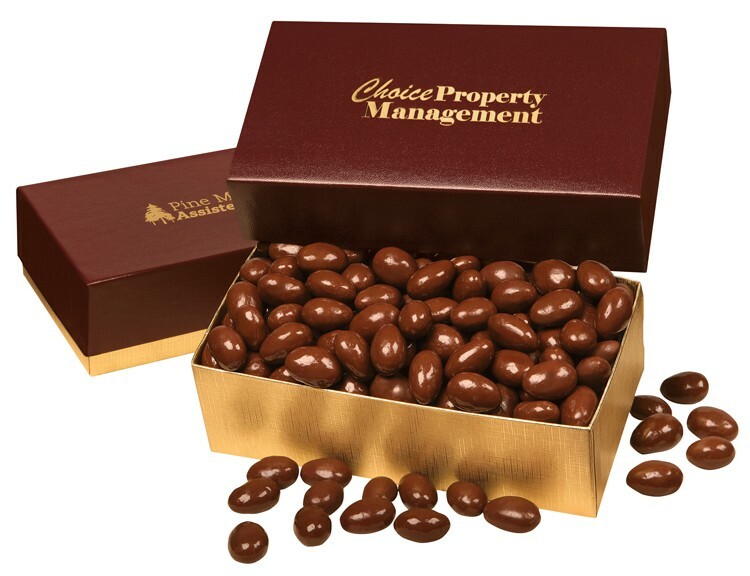 Packed inside are smooth Chocolate Covered Almonds, three-quarters of a pound. Food gifts make great thank-you gifts! Cannot be combined with any other discount offer. Less than minimum orders are not eligible for discount pricing. 7 1/8" x 3 7/8" x 2 1/4"
• Price includes imprint foil-stamped in gold on lid. • Imprint Area: 3 1/2" x 1 1/2"
• Ship Wt: 1 lbs. each; 13 lbs. per case of 12.